On Sunday 1 July A.P.E, If I Can't Dance and the Stedelijk Museum Amsterdam present Keren Cytter's performance Show Real Drama at Het Veem Theater in Amsterdam. The performance will be presented twice, at 5pm and at 8pm. In between the performances, at 6.30pm and accompanied by a buffet dinner, If I Can't Dance launches the new publication D.I.E NOW â€“ The True Story of John Webber and His Endless Struggle with the Table of Content, a monograph on the first performance by Keren Cytter commissioned by If I Can't Dance. The presentation of Show Real Drama in Amsterdam is realised through thecollaboration of If I Can't Dance, the Stedelijk Museum, A.P.E (art projects era), and Het Veem Theater, and is financially supported by the Goethe Institut Amsterdam. 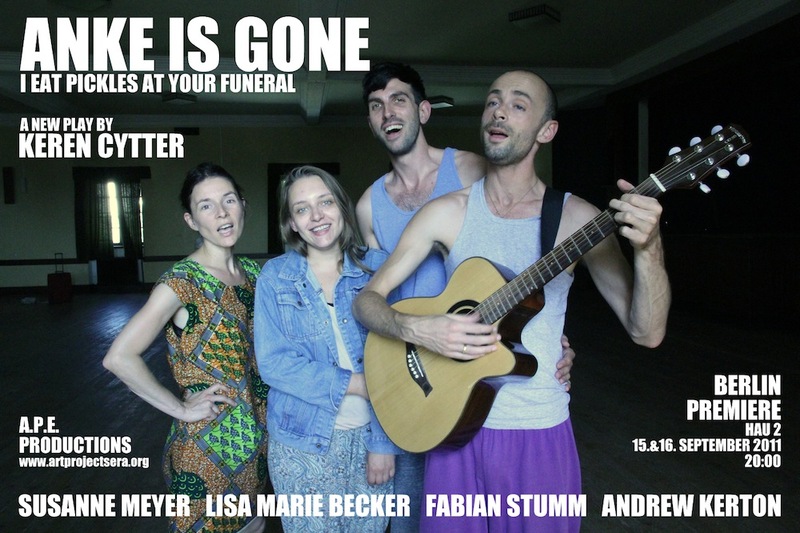 As part of Images Festival, I Eat Pickles At Your Funeral will be presented at the Al Green Theater in Toronto. I Eat Pickles At Your Funeral is a performance that plays with the structures of a theatre play and the theatre itself. On stage and off stage swap places, which means we mostly see the story that happens “off stage.” The intrigues between the actors are mixed with the rehearsal of lines and scenes. As the play develops, it becomes unclear what is acted or not. Both the stories and characters seem to mingle and at its peak it seems that the mixed-up mental state of the characters has taken over. The play builds overlapping dialogues, inner monologues and repetitive movements, which are accompanied by video fragments showing part of the story and rehearsals; a mirror, table and chairs that represent lost props, but are the props at the same time; and lighting design that plays with the idea of being backstage. For the Asia Tour of Show Real Drama this spring, Keren Cytter and Susie Meyer have designed a unique t-shirt. Susie is taking the night train to visit Anke - her long time friend from high school. The roads of the two friends departed long time ago when Susie was accepted to The Lee Strasberg Theatre and Film Institute and Tina was suffering from clinical depression. This story is acted in the back stage of the theater while the audience is exposed only to the actors in their empty moments and in the brakes between the scenes. The theater play and the relationships between the actors are slowly unfolding behind the scenes and in front of the audience. The actors talk continuously and move back and forward from the stage to the backstage while their words and actions are overlapping one another.